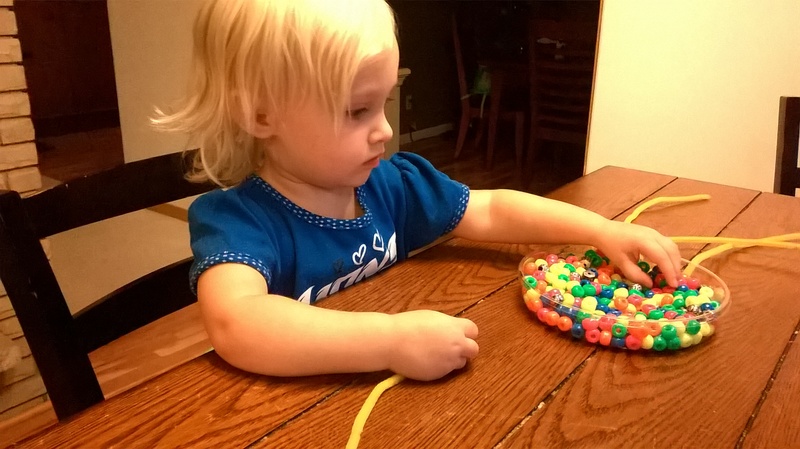 Pinch and Pull Bracelets are a great way to work on those fine motor skills, as well as make some great dress up jewelry! 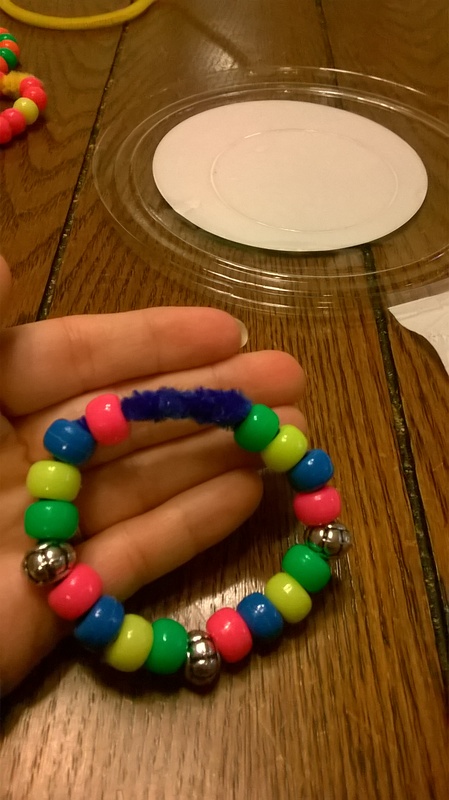 All you need are pipe cleaners and beads. 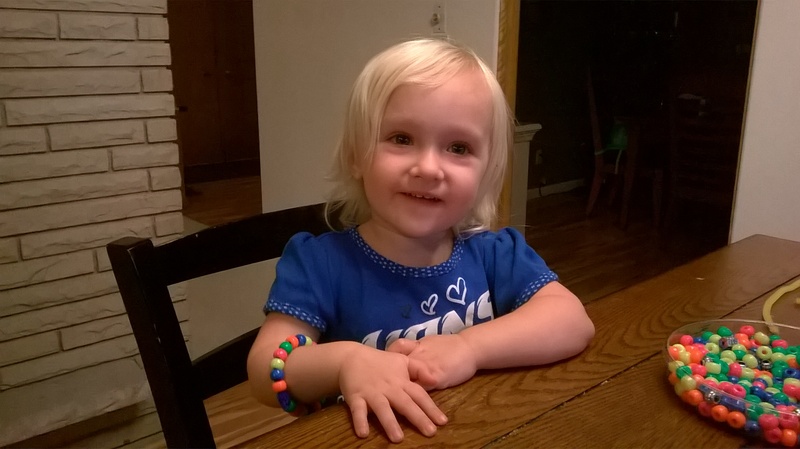 Babs is wears her bracelets all the time. 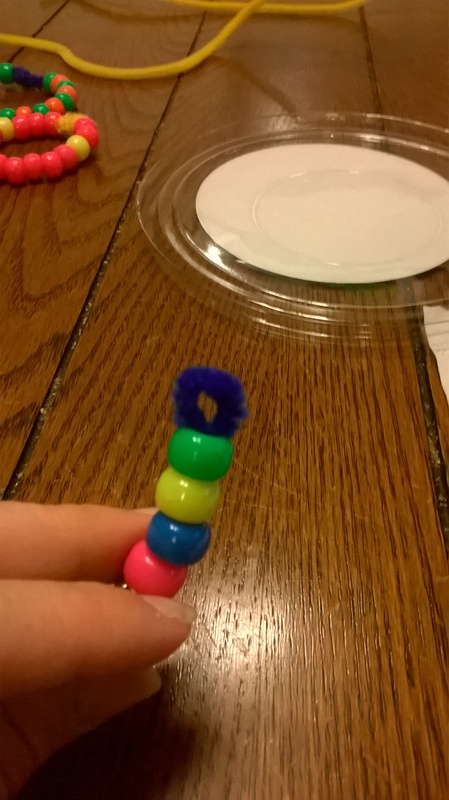 The first thing you have to do is make a loop on one end of the pipe cleaner. 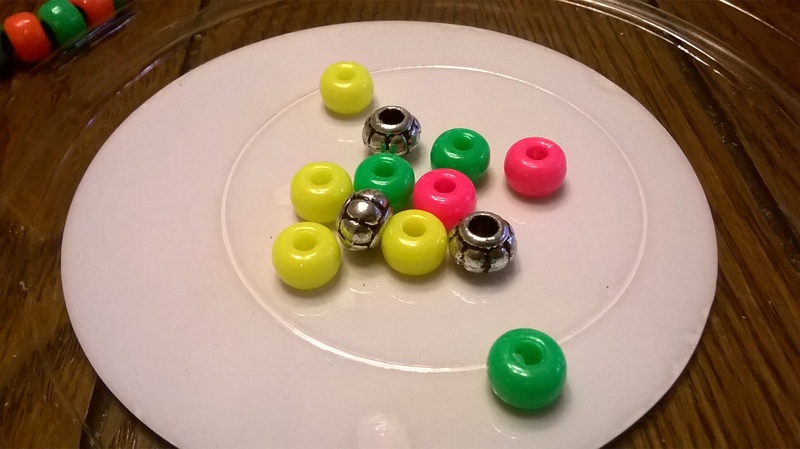 This will keep the beads from falling off and give you an easy way to size it later. 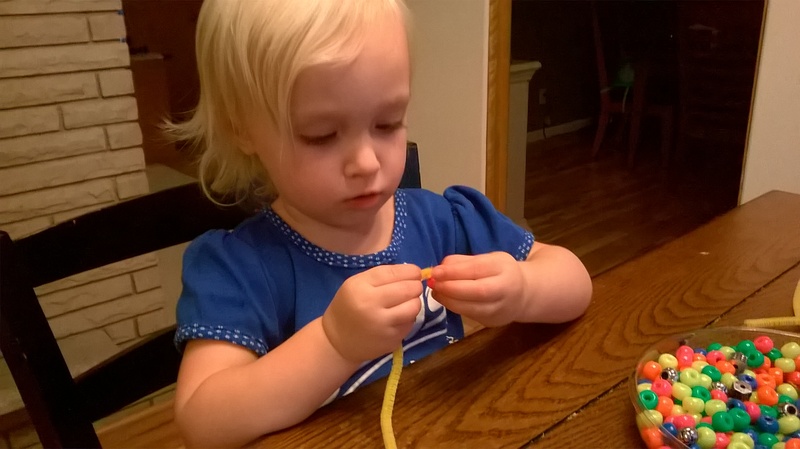 After that your little one is reading to start threading beads. 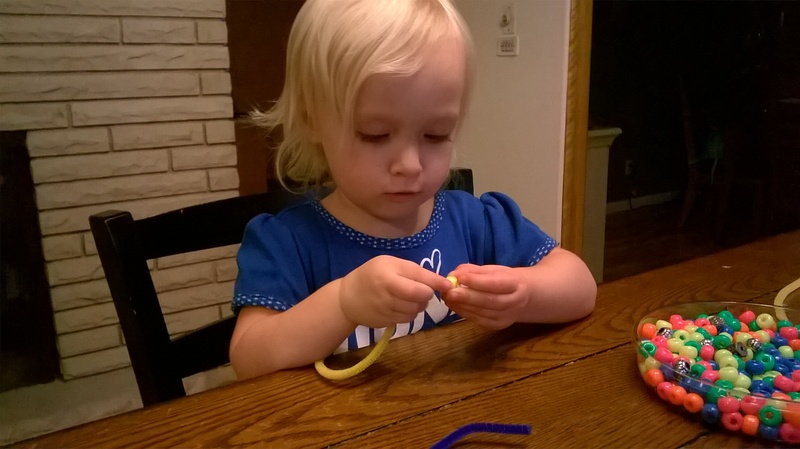 I showed Babs how to thread the bead onto the pipe cleaner. Now, the tricky part for us was making sure the bead didn’t just fall right off. This is where the pinch and pull part comes in. 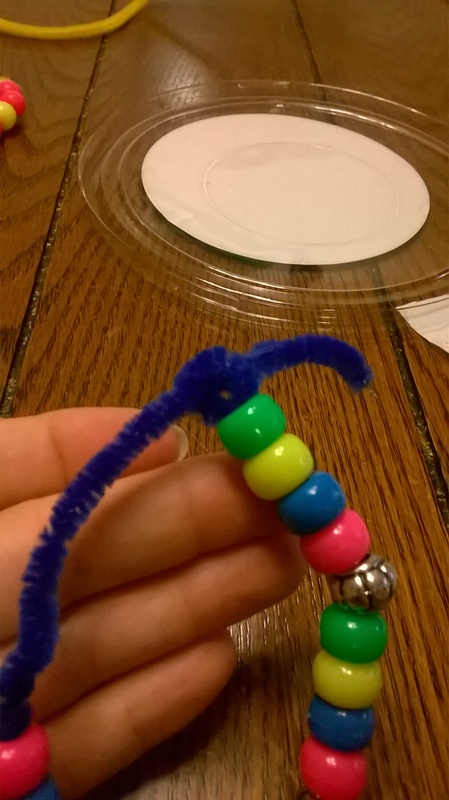 After they put the bead onto the pipe cleaner have them use their thumb and index finger to pinch the end of the pipe cleaner, then show them how to use their other hand to pull the bead down….pinch and pull! This became easier and easier the more we threaded beads and eventually Babs only needed the verbal reminder, “pinch and pull”. After they have finished threading the beads you will need to close up the bracelet. To do this bring the loop and opposite end together. Thread the straight end through the loop. Pull as tight as you need for it to be the correct size. Once you have the correct size wrap the extra pipe cleaner around the loop to close it. Make sure to tuck the pointed ends under to prevent the kids from getting scratched. Adult supervision is required fort his activity because the beads are a choking hazard to little ones.